The 2012 Cornwall Inter Counties Team travelled to Nottingham University on Wednesday 11th April to compete for the 6th consecutive year in the Prestigious National Under 17 4 day Team Event. The Team were intending to build on last seasons best ever 34th place. The ICT places great demands on the 40 Team of 5 boys and 5 girls over a gruelling 10 match format. 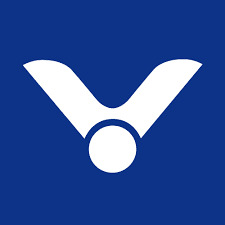 The Players from across England and Northern Ireland are of top International and National standard,including the current European U17 Boys singles champion. Cornwall started the Tournament after a 12 month programme of out of county tournament commitments with a grade 3 seeding in their first round group. A hard but close fought match v Leiscestershire resulted in a 7-3 win to their opponents. Performances were promising with the Team Captain Kris Jasper and Hester Luke both taking impressive wins at no1 singles. The second match v Cheshire was always going to need some tactical changes and although losing 10-0,performances by both Chris Cooper and Jake Brazewell in their singles against top opposition were impressive. This was all building to a climatic match v Durham in the evening to see which team moved into a higher group on the second day. The match commenced at 7pm. The atmosphere was loud and intense with vocal support from parents who had travelled from both counties being present in the University 12 court hall. A nail biting no1 boys doubles win by Kris and Simon Cox meant that after 2 hours 15 minutes on court it came down to Georgia Higgs and Hester Luke at no2 Girls Doubles to win in 2 ends and take the Duchy through to a potentially great second day. A fantastic calm display by both girls under intense attacking pressure from their opponents won the day. Cornwall drawing 5-5 but winning by 4 ends on a countback score. The second day meant a 9am match. Cornwall was on court at 8.30am in preparation and stormed through a Northumberland team right from the start. A strong team performance meant a 7-3 victory to the Duchy and the start of a consistent move up through the Tournament positions. Match 2 against Staffordshire was a potential pitfall with top ranked boys and girls within their ranks. Cornwall responded with what is arguably their best ever performance and certainly their best match result ever at the ICT. 9-1 to Cornwall,some simply outstanding performances,Hannah Robertson and Kris Jasper storming through their opponents at no1 mixed,with purposeful attacking shot selection. Chris Cooper and Sam Payne taking an inspirational game of mens doubles at no2,both girls pairings of Abi Logg and Hannah,Georgia and Hester winning in 2 ends. The match of the contest saw Kris take on a top quality Silver boy. What a spectacle, Kris winning in 3 ends. Match 3 left the Duchy contemplating a top 30 finish on day 4. Guernsey stood in the way but Cornwall were not to be denied with a professional 7-3 victory. After a slight early match wobble the girls took control in their games to increase the scoreboard. Day 3 saw a pivotal match against Worcestershire to decide who reached the 21-25 group stage. Cornwall fought for everything, our no1 girls doubles being outstanding taking a fantastic match in the 3rd end 15-12,Kris took on a Gold standard top 5 U15 boy. Another enthralling match saw another Duchy win. However a narrow loss in the mens doubles matches meant an eventual 6-4 loss, meaning a deciding group of 25-28. The players regrouped and took on Oxfordshire. The game of the match was undoubtably Jake Brazewell at no2 boys singles. Games go to 15 points at the ICT, thereafter it is extended play to a sudden death single point win at 20 all. After a titanic battle of nearly 30 minutes on court Jake stood at 19-19. He calmed himself and took the first end 21-19 !!! Jake retained his concentration to win in two ends. However the Duchy ended with a 6-4 defeat. The final match of a hard day found local South West rivals Gloucester on the court. 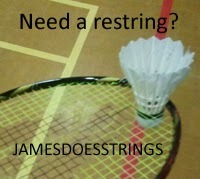 This was going to come down to success or not in the mixed doubles with some highly rated girls in the Gloucester team. Kris and Hannah won in 3,Rachael Collard and Chris won a comfortable first end. The opposition fought back and it resulted in a 3rd end. With the score 14-10 match point to their opponents Chris and Rachael found a resilience to pull back to 14-14. The game went head to head to 20-20,the last point going to Gloucester 21-20 !! What a game ! An unexpected loss in the Boys at no1 meant an unexpected 6-4 loss to Gloucester. Undeterred the team left the hall in high spirits with a final match on day 4 against Cumbria to contemplate. Some tired players walked out on both sides at 12 noon on the last day. A steady start saw a even match developing. Kris again simply breathtaking in defeating a U17 Gold Singles player. Jake showing incredible fortitude to go 3 ends at no2 singles losing 17-15 in the third,another monumental effort by Jake. The match started to drift away from the Duchy but Georgia and Hester remained resilient taking another great victory in two ends in their doubles. Final score 8-2 to Cumbria. A great match to finish with great sportsmanship being shown on both sides of the court throughout the match. A final position of 28 from 40 Teams surpasses last years best ever finish of 34 and puts the County in the top 30 team bracket at the National level for the first time in their history. An incredible feat by the team competing at such a high level against top Nationally ranked players. This left a courtside Team photo opportunity to be completed and a return to the University to watch the final match Yorkshire v Ulster for the 2012 Trophy. Yorkshire eventually winning the ICT for the 17th year out of 46 years of Tournaments. The team returned home late on the Sunday evening with our final players arriving in Penzance some 350 miles from the competition well after midnight. Team Managers ; Sue Cooper,Cathryn Bick,Jon Wotton. A sincere thank you to our main sponsors DAIRY CREST DAVIDSTOW. TAG SPORTS and Exhibit 1 print and Embroidery for such professional kit. 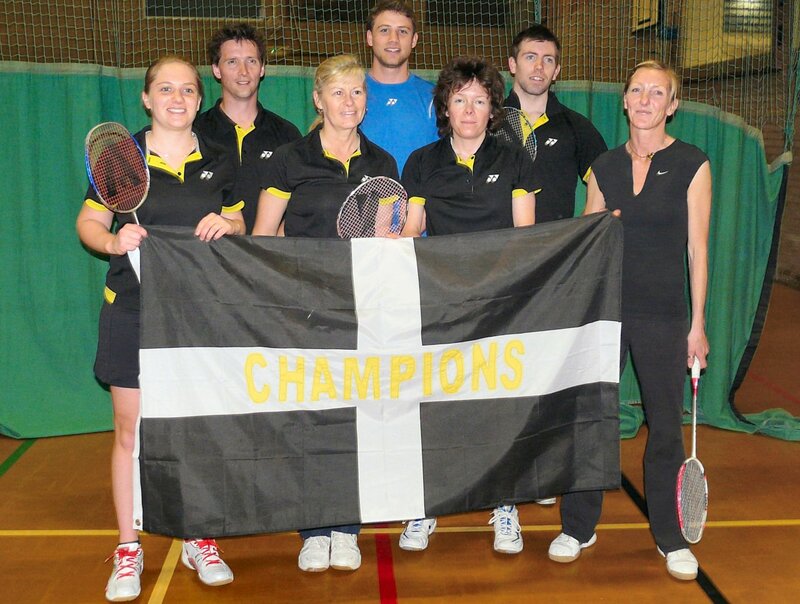 Completing a fine weekend for Cornish Badminton and following on from the 1st team’s epic victory over Guernsey, the 40s team had their own stunning win the next day, beating the visitors from Avon 9 – 3. Strengthened by some new blood in the shape of Nick Phelps who partnered Bob Bell to power their way to 2 mens doubles success, the 40s looked too strong for Avon from the start. In the other mens, Pete Bazin and Adam Widdison were very unlucky to lose a tight 3 ender to the second Avon mens, before losing to the first pair, despite some valiant defending. The Cornwall women were in fine form to notch up all 4 of the ladies doubles, 3 going to 3 ends and with some nail-biting rallies. Jan Santillo and Lynda Beer continued their usual winning ways in both their games, and Rachel Irish and Lorna Riggs battled their way through 2 close games to emerge victorious. Cornwall needed just 1 more game in the mixed doubles to secure the match, and in the end, they won 3 out of the 4 to make it a comfortable, excellent result. Bob and Lynda were narrowly beaten in the top slot, but Nick and Rachel, Pete and Lorna, plus Adam and Jan all won their 3 enders. 7 of the 12 games in the match had gone the distance, with Cornwall winning 6 of them – showing the home team’s strength, fitness and determination to win for one and all. The season now closes with Cornwall 40s sitting mid table, an good improvement on previous years and giving positive signs for the next season to come. For the season’s finale, the new Division 3 champions, Cornwall, took on the visiting Guernsey 1st team at Polkyth Leisure Centre. The Cornish team were missing 3 regular players due to other commitments, so were expecting a tough fight for their last match this year. The home men singles players, James Whetter and Shane Maton, started the game off in fine style, with 2 excellent victories against their island opponents. Rose Willis, playing in the number 1 ladies slot for the first time, did well to take this game to 3 ends and just lost out, although Emily James helped the team to a strong 3-1 lead by winning her singles impressively. The mens doubles was a Cornish black and gold whitewash, with James in stunning form alongside his partner Guy Michell, and the newer pairing of Shane and Tom Lyle looking good in winning all their games. Guernsey had brought a strong ladies team, and their first pair proved too good for both Rose and Jan Santillo who had stepped in for Cornwall at the last minute, as well as Emily and Vicki Thomas. Rose and Jan used all their experience and turned the second ladies round in their Cornwall’s favour, winning the match with an exceptional result, while Emily and Vicki played well in their second match, being very unlucky to just lose a tight 3 ender. Cornwall needed to win at least 2 of the 3 mixed doubles to gain their 3rd maximum point victory in a row, and the watching crowd had plenty to cheer about as Tom and Vicki secured the first win in just 2 ends of attacking, solid play. Guy and Jan were up against an experienced Guernsey pair in the number 2 slot, and narrowly lost in 2 ends, leaving James and Rose as top pair to bring home the victory. This they duly did, but only after a nervous games split to take the final game to the wire, when James and Rose turned on the style in the third, and completed a fine performance to bring the final score to 10 games to 5. This fantastic win, means Cornwall have won the Division by 4 clear points over Berkshire, and takes them up to Division 2 next season, as high as any Cornish team have been in over 30 years – a truly memorable achievement for this young team. John Tresidder, the Cornwall Badminton Press Officer, who was a delighted spectator at the match, enjoyed it thoroughly and commented: “The Cornwall Team, overall, gave their All and were magnificent, with James Whetter, in particular, with his 4/4 victories, seen to be in supreme form throughout the proceedings. Team players – James Whetter, Shane Maton, Guy Michell, Tom Lyle, Rose Willis, Emily James, Vicki Thomas, Jan Santillo. Missing this match – Ross Lashbrook, Jo Philp and Bronwen Wotton. CORNWALL’S top badminton stars set off on the long trek to Reading, last Sunday (April 1), hoping for a narrow victory over their promotion rivals, Berkshire County, who were sitting two points clear at the top of the table. Cornwall had narrowly beaten Berkshire at home, by 8 rubbers to 7, earlier in the season, writes Sue Biscoe. Straight into the singles, after the four-hour drive, Cornwall’s Ladies’ singles players, Johanna Philp and Rose Willis quickly and impressively accounted for their Berkshire counterparts, as did James Whetter in the Men’s Singles, against a hard-hitting Chinese player. Shane Maton, in the number one spot for Cornwall did well to go to 3 ends, but found the Berkshire man just too mobile to handle, and so the Host County started the Level Doubles’ discipline, in a strong position -at 3 games to 1 up. Things became much more tense as the Berkshire 1st Men’s pairing proved too dominant for both James and Guy Michell, as well as Ross Lashbrook and Tom Lyle, Cornwall’s second Men’s duo. The Cornish men then turned things around and both beat the second Berkshire pair in fine style with some excellent displays of attack and defence. So the match was won already, going into the Mixed Doubles, at 8 games to 4, and the jubilant Cornwall team were suddenly aiming for all 3 points if they could win at least 2 out of the 3 mixed games. James and Jo showed the way with a fantastic victory over the first pair, Guy and Rose just lost in 3 ends to the second, leaving Ross and Bronwen with the last chance at number 3 mixed. Three tight ends later in an exciting, see-sawing game, and the Cornish pair were there, a great win for them and the team overall. This 10-5 handsome victory, with the maximum three points, takes Cornwall Chiefs one point clear at the top of Division 3, and means that they cannot now be caught at this late stage of the season. They have achieved this amazing result, still, with one game in hand, at home to Guernsey, next Saturday, April 14 (2.00 pm), at Polkyth Leisure Centre, St Austell, when supporters and spectators are very welcome. And, spectators can be assured that the Team, with an unassailable lead, in Division 3, will be going flat out, as usual, to beat the Visitors, from the Channel Islands. NB: Team photo call: is at 1.45 pm in the Hall. To win promotion to BADMINTON England’s Inter-County Championship (ICC) Division 2, for the 2012-2013 campaign, thus playing against some of the top flight teams, is an excellent achievement for this young team, the first time in some 30 years, that Cornwall Badminton has competed at this level. It also indicates the healthy state of Kernow Badminton, including a thriving Cornwall Youth Badminton scene, sponsored by Dairy Crest Davidstow. Other squad players – Vicki Thomas and Rachel Irish. Co-managers - Brian Hannibal and Sue Biscoe, who is also the County Match Secretary.